The New York Jets’ head coaching search has reportedly come to an end with the selection of perhaps the most boring name on the market. 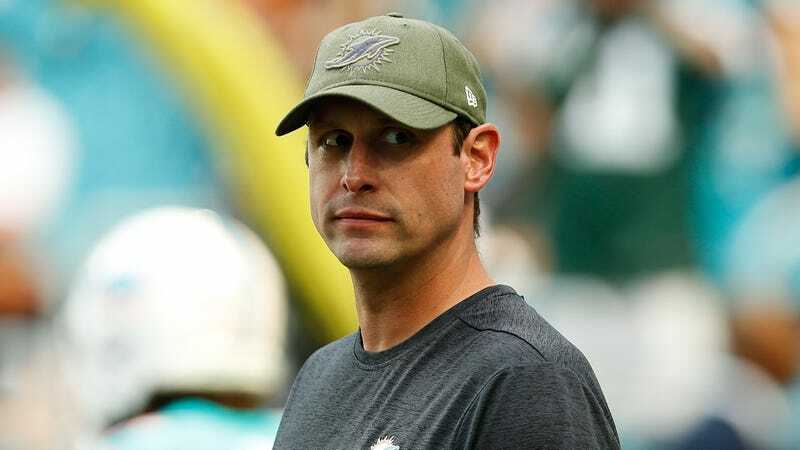 Despite a list of potential candidates that included exciting assistants like Kansas City’s offensive coordinator Eric Bieniemy or hotshot Cowboys d-backs coach Kris Richard, the Jets have opted instead to pick up the Dolphins’ sloppy seconds, hiring Adam Gase to replace Todd Bowles. Gase just got fired by Miami after a 7-9 year, and he only managed a 23-25 record in three seasons. But hey, at least he went 5-1 against the Jets! One complaint voiced by players about Gase is that he didn’t necessarily stick with what was working in games. One player said the team would be running the ball successfully, and Gase inexplicably then started throwing it. One sentiment we heard: Gase wanted to fool the other team but sometimes ended up outsmarting himself. That frustrated some players. Another view expressed from the locker room: Gase wasn’t as emotionally level as a head coach needed to be at times. One player said if a play-call didn’t work, he sometimes let it carry over for several minutes and was out of sorts emotionally. That player said a more level, a more even emotional approach would have been preferred. But there is some good news, here, no matter who you root for. Packers washout Mike McCarthy was reportedly only interested in the Jets job, so at least he won’t be a head coach in the NFL next season.